The theme for the fifth day of Kwanzaa is Nia, which means "Purpose." Today is the fifth day of the twelve days of Christmas. Hanukkah has ended. "Today isn’t just about politics for me. It’s personal. I was too young to remember John Kennedy and I was just a child when Robert Kennedy ran for President. But in the stories I heard growing up, I saw how my grandparents and mother spoke about them, and about that period in our nation’s life—as A TIME OF GREAT HOPE and achievement. And I think my own sense of what’s possible in this country comes in part from what they said America was like in the days of John and Robert Kennedy." "And it lives on in those Americans -- young and old, rich and poor, black and white, Latino and Asian and Native American, gay and straight -- who are tired of a politics that divides us and want to recapture the sense of common PURPOSE that we had when John Kennedy was President of the United States of America." "Boy with Amaryllis and Orion" is a drawing by me, using the trackpad on my iBookG4, on the day before Martin Luther King Day in January of 2008. I had just received a letter from R, who had been in the stroke rehab unit of a VA hospital in California ever since coming out of a coma caused by a brain stem stroke in September 2007. The letter to me was written in R's behalf by his nurse, Yolanda. He signed it in a shaky hand, but drew a perfect rose for me. He was an artist, too. 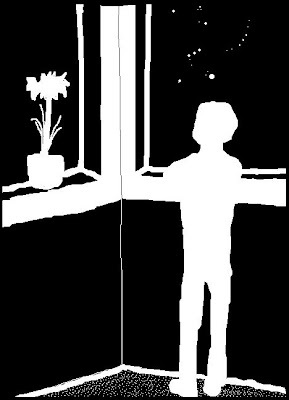 In the drawing above, I pictured him as a young boy with his life before him, standing alone at night looking out the window at Orion. I knew that boy was still a part of him. I didn't know he had had a stroke until December 31, 2007, when his sister wrote me a letter after I had sent her a holiday card. I had been out of touch with R since 2003, due to his drug and alcohol problems aggravated by PTSD. His sister hadn't had my home address, phone number or email address. For anyone new to my blog, I met R on the beach at Half Moon Bay, California, when we were 17 years old. In 1969, R was was drafted into the U.S. Army, almost a year after Robert F. Kennedy was assassinated, in the first few months after Richard M. Nixon was elected President of the United States. R spent 1970 in Vietnam as a helicopter mechanic stationed in Da Nang. He was against the war. He almost didn't go to Vietnam, calling me from Oakland Army Base the day before he left, asking me to pick him up and take him to a draft resistance center for conscientious objectors. He talked with a woman who was a draft counselor, as I sat out in a hallway. The door opened, and he thanked her. We walked back out to my car. He looked out the car window as he said to me while we drove away from the draft resistance center on that winter morning in January of 1970, "If I go ahead with this, I am going to meet the defeat of her challenge." He didn't believe he would be able to obtain conscientious objector status because he was a high school drop-out who didn't go to church and didn't believe in God and had set no precedence as a conscientious objector in his life up to then. I was willing to go to Canada with him. He didn't want to go to Canada or to prison. He made the decision to go to Vietnam. We lived together from the day of his return from Vietnam on December 8, 1970, until early in May of 1971 when we separated, remaining friends. In the letter the nurse wrote in January of 2008, R said that he wanted to see me again but he encouraged me to continue with the college classes I had just started. R saw the above drawing, along with the others in that series of drawings that was inspired by him. In April, I was able to drive to California to spend four days with him in the intensive care unit the week before he died. He was unable to speak, but his last "words" to me were the thumbs up sign. It's a long story, 42 years long. I'm working on a book of art work and poetry from those years. I just remembered something R said to me in 2002, while he was undergoing chemotherapy for lung cancer. There was something he had done that he believed was absolutely unforgivable, something that he believed he could never tell anyone. I encouraged him to talk with someone at the VA hospital. He said he wasn't going to tell anyone. He couldn't forgive himself. He said, "I was young then. . . "